May 13 marked the 23rd year since Falun Dafa, a traditional Chinese practice of meditation that is now persecuted in its homeland, was taught to the public in Changchun, northeastern China. In anticipation of the holiday, practitioners of Falun Dafa (also known as Falun Gong) around the world have held events and celebrations, and public officials have extended letters of greetings and congratulations. The largest celebration of Falun Gong will take place in New York City this week, with a major conference featuring Falun Gong practitioners sharing their experiences in the discipline; a large parade through the center of Manhattan, with a marching band; and a live concert in Foley Square. A total of 41 elected officials in either the city or state of New York issued official letters marking the occasion. These included, various citations, greeting letters, proclamations, and certificates of congratulations—four from the federal level, over 20 from district assemblymen or assemblywomen, and more than a dozen from the city, county, or township level, including councilors, borough presidents, mayors, and town supervisors. Federal officials include U.S. Reps. Zeldin Lee (R-N.Y.), Steve Israel (D-N.Y.), Grace Meng (D-N.Y.), and Nydia M. Velázquez (D-N.Y.). Other national United States politicians who issued letters of support include Sen. John Cornyn, of Texas, who said that gatherings like Falun Dafa Day “highlight the abundance of cultural heritage that makes our state great.” Three members of Congress from Texas also issued letters of congratulations and support. The statements gathered from officials at all levels of government in countries around the world often condemn the persecution of Falun Gong and praise its contributions to society along the way expressing good wishes for the celebration of Falun Dafa Day. Practitioners point to these official statements as a sign of how the practice of Falun Gong is accepted and welcomed around the world. The evidence of such acceptance is of particular importance in the context of mainland China. In 1999 the Chinese Communist Party launched a campaign of hatred and vilification directed against the practice, a key component of a comprehensive and violent persecution. The propaganda was particularly vehement, given the awkwardness and difficulty of targeting for elimination a peaceful, traditional spiritual practice. It had become deeply rooted and widespread in Chinese society, and which just years previously was even supported by the regime. After Falun Gong’s introduction to the public in 1992, Chinese official statements said that there were 70 million practitioners by the late 1990s, and Falun Gong sources estimate that around 100 million practiced it. 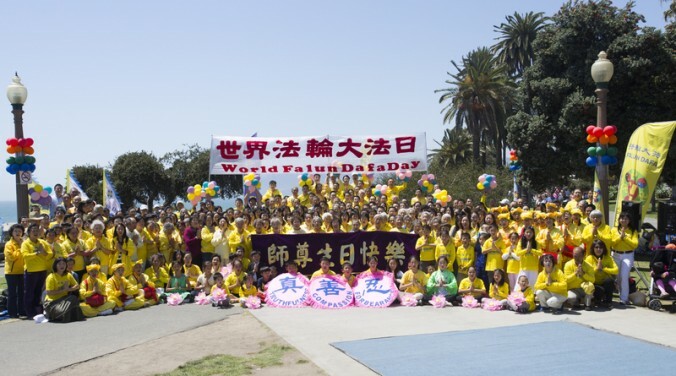 As well as the events in New York City, World Falun Dafa Day is marked by practitioners who hold their own events around the world, and who also receive and cite letters of acknowledgement and congratulations from elected officials. The Falun Gong website Minghui.org has reports of Dafa Day celebrations from Singapore, Turkey, the U.S. Midwest, Houston, Los Angeles, Hong Kong, Korea, Taiwan, Japan, France, England, and elsewhere. As the week goes on, more reports are expected to be published. The day was celebrated in Montreal, Canada, on May 9, which was unusually hot. Practitioners held a parade through Chinatown, then did the exercises in a public square—some onlookers took photographs, while others learned the exercise movements. In Brisbane, Australia, in the northern state of Queensland, poster displays were erected depicting the Falun Gong exercises and the practice’s journey from a few hundred students to millions of practitioners worldwide, most of whom are in China. Falun Gong volunteers also handed out fliers about the discipline, and collected signatures to be submitted to the United Nations human rights high commissioner to investigate the evidence of organ harvesting of Falun Gong adherents in China. Over 30 local public officials issued letters of support. Laurel Andress and Nathalie Dieul contributed to this report.